Rent or buy? It is the question on the minds of many as we cast full sail into the selling season. Whilst stories are written about which cities and neighborhoods are better to rent or buy in, we can hang in the peace of a fairly stable market where there are good options available for rent and sale. Spring is sprung, yet there is no raining on the hit parade of homeownership. The number of signed purchase agreements in the 13-county Twin Cities region surged by 30.0 percent to 5,301 contracts. Sellers were also confident, as new listings increased 21.4 percent to 7,887 during the month. That is the largest increase in pending sales since August 2011 and the highest March count since 2005. New listings showed the second largest increase since July 2013 and the highest March count since 2010. Inventory levels rose 0.7 percent to 14,127 homes, the second increase this year. The median sales price rallied 10.5 percent higher to $210,000, the strongest gain in over a year. The median home price has now seen over 36 months of year-over-year increases. Price per square foot—which adjusts for the square footage of homes selling—rose a more modest 4.5 percent to $121. Absorption rates remained flat at 3.3 months, and suggest an overall sellers’ market. Days on market rose 7.4 percent to 102 days. 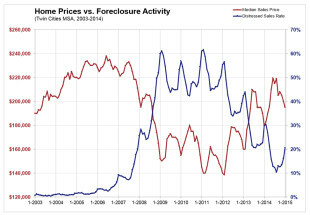 The role of foreclosures and short sales continued to diminish on both the list and buy sides. 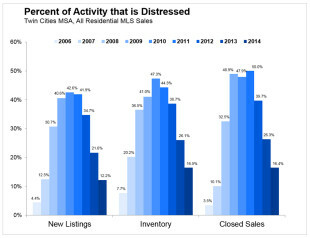 Traditional new listings comprised 92.2 percent of all seller activity, the highest level since October 2006. 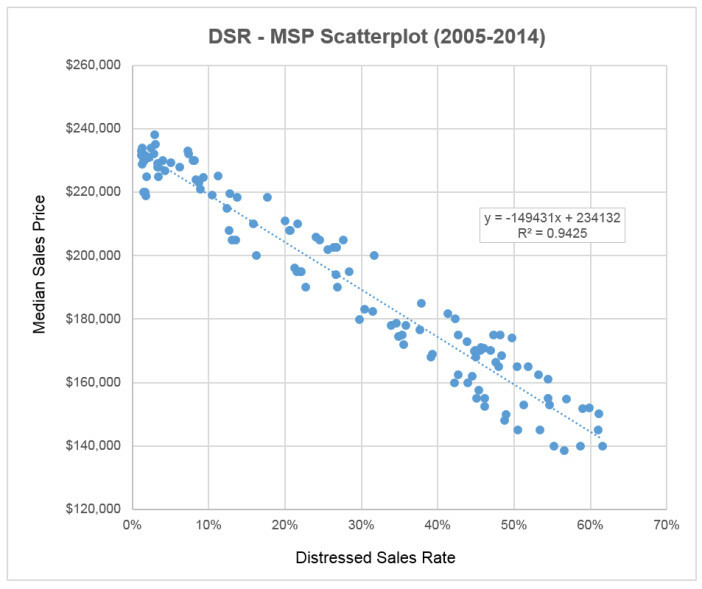 Traditional sales made up 84.9 percent of all closed sales, which is on-par with late-2007 levels. The finance environment remains favorable. Mortgage rates continue to hover near multi-year lows at around 3.7 percent, compared with a long-term average of about 7.0 percent. Improvements in the economy and household finances could partly offset the impact of rising prices and interest rates. The Twin Cities housing affordability index of 198 has been fairly stable since the end of 2014. A diverse and robust regional economy has served the Twin Cities housing market well throughout various cycles. According to the Bureau of Labor Statistics, the Twin Cities has one of the lowest unemployment rates of any major metropolitan area in the nation at 4.0 percent. Many residential real estate markets across the country and locally are in a fairly stable state of balance, causing most stories about housing to be conservative in nature with not much change to report. As the weather continues to warm up across the country, more sales are expected. The Twin Cities housing market showed refreshed signs of strength last month, partly in anticipation of what looks to be a promising spring market as well as favorable interest rates. Buyer and seller activity surged in February. New listings increased 23.2 percent to 5,690 during the month, the largest year-over-year increase since July 2013. Pending sales—or a count of the number of signed purchase agreements—increased 21.8 percent to 3,834, the largest year-over-year increase since October 2012. With only two months in the books, already buyers and sellers have shown more activity than they did for any one month of 2014. Inventory levels were still lower, down 2.0 percent to 12,700 homes, but that trend is unlikely to continue. The median sales price rose 10.4 percent to $202,000, the strongest gain since last February. This increase officially marks 36 consecutive months or three full years of year-over-year median price gains. Price per square foot—which adjusts for the square footage of homes selling—rose 6.6 percent to $120. Absorption rates remained flat at 3.0 months, and still technically favor sellers. That said, today’s market environment is slightly less competitive than in 2013. Days on market rose 7.1 percent to 106 days. The market share of foreclosures and short sales continued to shrink on both the supply and demand side. Traditional new listings rose a substantial 33.8 percent, while foreclosure and short sale new listings each fell between 25 and 30 percent. Traditional pending sales rose a massive 41.5 percent, while foreclosure and short sale pendings each fell between 32 and 36 percent. This dynamic has partly enabled three consecutive years of rising prices. The finance environment remains enormously attractive. Mortgage rates continue to hover between 3.5 and 4.0 percent. The long-term average is roughly 7.0 percent. This appealing affordability picture can potentially offset recent home price increases and also encourages renters to consider homeownership. The Twin Cities housing affordability index of 210 has actually increased 2.4 percent from last February. A highly diverse and robust economy has served the Twin Cities housing market well throughout various cycles. According to the Bureau of Labor Statistics, the Twin Cities has the lowest unemployment rate of any major metro in the nation at 3.3 percent. Recently, national private job creation has accelerated toward 300,000 jobs per month. market in recent years. Warmer weather sure can’t hurt either.